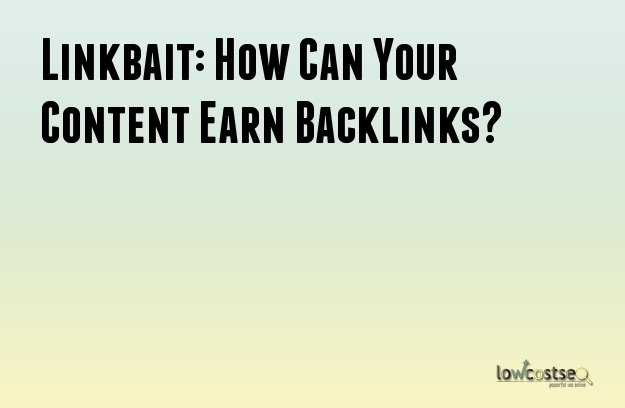 Linkbait: How Can Your Content Earn Backlinks? At the core many SEO strategies is the generation of a strong backlink profile. Typically, this is done through outreach – whether that happens to be writing guest posts on external platforms with relevant links back, or simply sending your content to people who would be interested and likely to share/link it. However, there’s also content that does well by itself – often generating more links than possible via your initial outreach efforts. Of course, for SEO this is wonderful, but it is never guaranteed. So, what content makes the best linkbait and how can you develop your own content to improve its own chances? Most users are aware of the likes of clickbait – small pieces of content with catchy, often misleading titles. These often do the rounds on social media, but rarely reach long term success. They are often shared by the websites that create them, but not by external users. Why? People want relevant, interesting topics. A 5-minute read on a clickbait website doesn’t offer this value. It’s not a page people will come back to and neither does it have anything people want to showcase to their friends or family. That’s not our goal when trying to develop strong links, so target your efforts on your most relevant and useful pieces of content. This doesn’t need to be articles, of course. Infographics and other visual media can also be shared. However, it’s possible people will share this without necessarily providing a link back to you. If you can keep track of the media in question, it doesn’t take much to ask these websites for a referring link – after all, they’re already using your content. Timing and contemporary relevance – is this content relevant to today’s situation? Fame – does it involve famous people or companies? Regardless of the story, it’s usually more important if it happens to a famous figure. While you might not produce content with this in mind, this is what matters when content is shared. If you produce content that is out of date, you’ve failed the timing factor. Likewise, proximity can be a hindrance online. If your content is specifically UK based, why should US readers share it? As for scale, this can be seen with the Skyscraper technique but be careful, because going too wide can lose some of the impact. How do users see content? Ahrefs suggests a four step process. First, the user sees the content, then consumes it and enjoys it. Linking only comes after this – after all, nobody stops halfway through something to send a link out. In other words, don’t stuff your content with requests to link (such as facebook and twitter widgets) half way through. Similarly, try to focus the content on enjoyment. Offer visual aids, a sense of humour and even a little emotion. This makes the piece feel more relatable and encourages people to continue reading. There’s a reason some of the most shared content has personality, even if an academic essay might have more relevance or useful information. Ultimately, it’s up to users which of your content gets naturally shared the most. Yet, if you identify which pieces are doing well, you can edit them to make them even better. Likewise, you can use this information to ensure all further content also relates with your audience better. This will help increase your chances of natural success - alongside your own SEO efforts and backlinks, of course!